We've figured out a way to add a little more nutrition into a classic pastry without sacrificing its kid appeal. 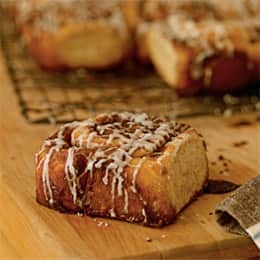 Our cinnamon roll recipe also helps young bakers acquire a taste for the heartiness of whole wheat by letting them include as much of the flour as they like, one cup or two, or somewhere in between. The more whole wheat, the denser the rolls, but warm from the oven, any version of this recipe will prove a delicious lesson in wholesome baking. Combine the milk, sugar, salt, and butter in a microwave-safe glass bowl. Microwave the mixture on high until it's hot, about 1 1/2 to 2 minutes. Set it aside and allow the butter to melt and the mixture to cool until it's just warm. In a large mixing bowl, use a wooden spoon to combine the flours, then stir in the yeast. Stir the egg into the milk mixture, then stir the milk mixture into the flours. Continue stirring until the mixture forms a soft dough. Transfer the dough onto a floured surface. Sprinkle it with more flour and pat it into an oval shape. Fold the dough in half and knead it with your knuckles or the heels of your hands. Give it a quarter turn, and repeat. Keep kneading, sprinkling with flour when necessary, until the dough is smooth, not sticky, and elastic (it should bounce back when poked), about 10 minutes. Oil a clean bowl, add the dough, and turn it to coat it with the oil. Cover the bowl with a damp cloth, place it in a warm spot (we put ours in a 100º oven with the door open), and let it rise until it has doubled in bulk, about 45 minutes to an hour. Meanwhile, make the filling. Combine the softened butter, brown sugar, and cinnamon with a fork until well blended. Grease a 9- by 13-inch pan and set it aside. Transfer the dough to a floured surface and sprinkle it lightly with flour. Roll it out with a floured rolling pin into a 12- by 16-inch rectangle. Using your fingers, spread the filling over the dough, leaving a 1-inch strip uncovered at one of the short ends. Beginning at the opposite end, roll up the dough to make a cylinder. Pinch the ends and the seam closed with your fingers. Using a serrated knife, cut the cylinder into 12 rounds. (Tip: To make even rounds, first mark the dough in three equal sections. Divide each of those sections in two, then divide those in two and slice along the marks.) Place each round in the prepared pan (place the two ends spiral side up). Cover the pan with a damp towel, and let the rolls rise for 45 minutes. Heat the oven to 375°. Bake the rolls until light brown, about 18 to 20 minutes. Allow them to cool in the pan on a rack for 15 minutes. For the icing, whisk together the confectioners' sugar, milk, and vanilla in a bowl. If the mixture is too thick to drizzle, add a few extra drops of milk. Dip a fork into the icing, hold it a couple of inches above the rolls, and drizzle the topping in a zigzag pattern. Protein 6 g (12% DV) Percent daily values are based on a 2,000-calorie diet. Your daily values may be higher or lower depending on your calorie needs.